Hey my awesome readers! This weekend I have taken a trip to NEAR fest in Deerfield New Hampshire. My goal? To achieve my technicians license for HAM radio. I’ve come down the night before because there is a second objective. 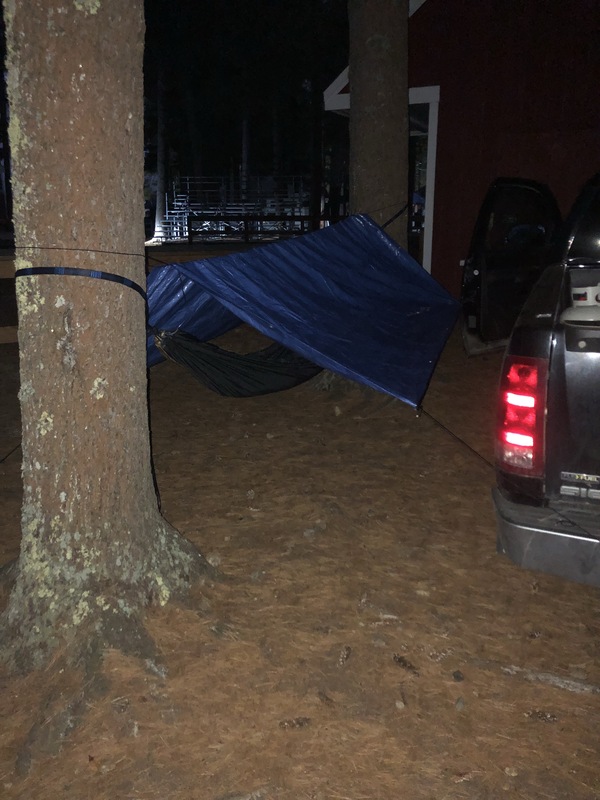 I recently purchased a backpacking hammock and I’ve been itching to try it out. I’m also working with the contents of my get home bag to refine the systems. So far so good. I should have set camp earlier though. I’ll also have to add some cheap tent pegs to the kit. Currently my rain fly is tied to everything close by and it makes movement a bit hard. But overall improvisation has paid off. I’ve given food a bit of a pass on this trip since there are concessions here to partake in. Most importantly though I’ve found a source of coffee in the morning. I have not met an unfriendly person here yet, and everyone has been incredibly helpful to this green horn. More to follow in the morning. Next PostA night of firsts.